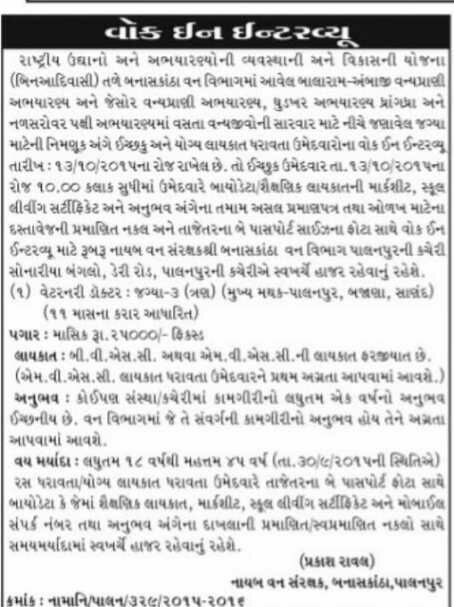 Forest Department, Banaskantha published Walk in Interview notification for recruitment for below mention posts on 11 month contractual bases. You can view official notification by following link. How to Apply: Interested candidates will be reach their for interview along with bio-data, 2 latest passport size photograph & all original & attested copy of relevant certificates to given below address. Send your application to given address: Deputy Forest Protectors, Banaskantha, Forest Department - Palanpur Office, Sonariya Bungalow, Dairy Road, Palanpur Office.